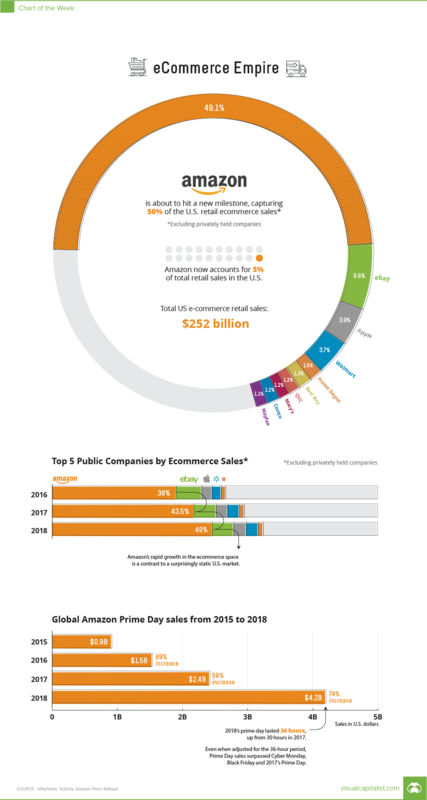 It’s no secret that Amazon is dominant in e-commerce. But despite this being common knowledge, the most recent data behind the explosion in Amazon’s market position is still stunning to behold: in the last two years, the already monstrous Amazon somehow was able to increase their share of the total U.S. e-commerce market from 38% to 49%. 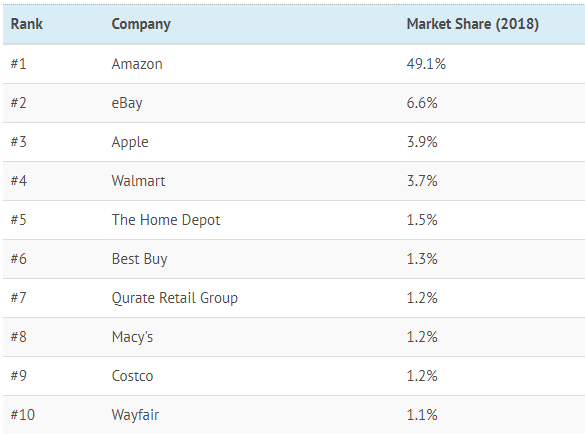 Amazon holds almost half of the massive $252.7 billion market – that’s more than double the market share of the next nine companies (including eBay, Walmart, Best Buy, Apple, etc.) combined! Will Amazon cap out at 50%, 60%, 70%, or beyond? At this point, no one can tell – but regardless of where the growth ends, such a level of dominance has never been achieved in the retail market like this before. Although not as stunning as the overall e-commerce market share, the company’s Prime Day numbers also illustrate the vast size and scale of the company. The most recent rendition of the annual event in July 2018 raked in $4.2 billion of revenue in a 36-hour period, even though the company had well-publicized technical issues that cost the company $72 million. The 2018 event brought a revenue increase of 74% – and Prime Day now generates more sales than Cyber Monday or Black Friday e-commerce sales. There’s no doubt that the Jeff Bezos Empire is holding strong: with $900 billion in market capitalization, Amazon is now in the conversation to join Apple in hitting the $1 trillion milestone in the coming months.